Our goal is to give the dedicated ballet dancer a summer of intense dance with the finest international teachers and choreographers. 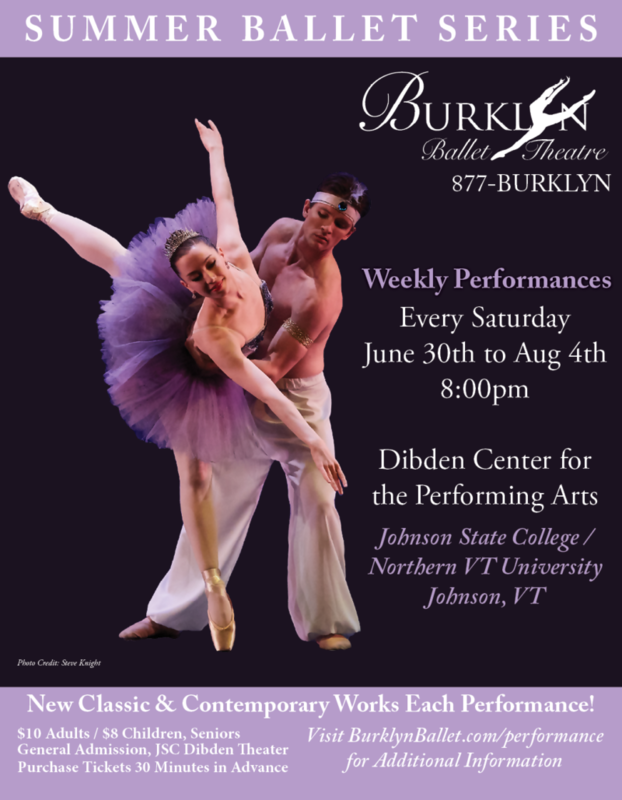 Each week culminates with a performance at Dibden Center for the Arts, a 500-seat theater on Northern Vermont University’s campus. Our dancers experience the thrill of performing a classical and contemporary ballet repertoire in front of a live audience. Each performance is complemented by full production values including professional lighting design, costumes and scenery. A Facebook account is not required in order to watch the live stream. BBT repertoire includes the classics and new works set by Master Teachers and emerging choreographers. This gives the students a chance to dance major roles. Teachers often start new choreographic works at Burklyn Ballet Theatre, which they later set on regional and professional companies. Below is a partial list of classic and contemporary works, as well as a list of Choreographers, which have been set on BBT dancers. Professional photos from our performances are available for viewing and purchase through Stephen Knight Photo in Stowe, VT.